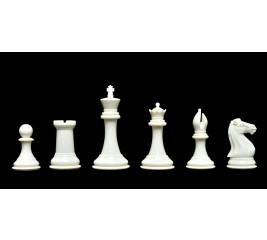 The House of Staunton is proud to offer the Calvert Chess set. 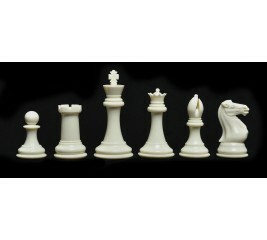 It features a 3.5'' King is a highly detailed and accurate reproduction of the Circa 1810 English Playing Chess Set design referred to as the Calvert Pattern. It is often, but wrongly, attributed to John Calvert, a Master of the Worshipful Company of Turners, located at 189 Fleet Street, from around 1790 to 1840. 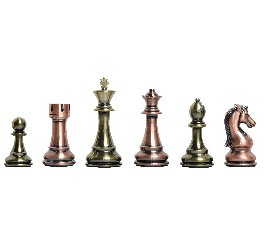 He specialized in exquisitely turned Chess sets for the aristocracy and in ebony/boxwood for the many coffee shops and clubs where Chess was a popular pastime. 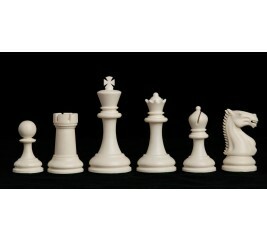 The House of Staunton is proud to offer the Contemporary Series Chess set. It features a 3.5" King with a 1.5" diameter base. The Chess pieces are heavily weighted with black base pads. These Chessmen have been designed for those players looking for exceptionally well-crafted Chessmen at a very reasonable price. 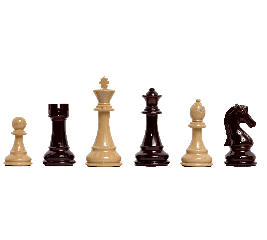 We at the House of Staunton understand that not everyone can afford one of our luxury Chess sets, so we proudly offer the Contemporary Series Chessmen for your consideration — a high-quality plastic Chessmen at a reasonable price! Brand New! 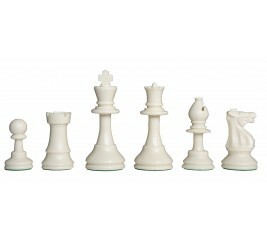 These oversized Staunton-style plastic chess pieces are perfect for both indoor and outdoor play! It features large plastic chess pieces measuring from 4 to 8 inches tall and a 3 by 3 foot vinyl chess board with rank/file notation. Makes a great gift for family fun! 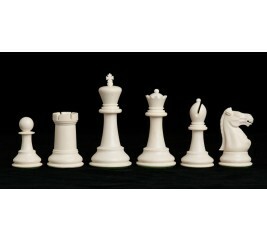 We are proud to offer the Zurich Series Chess set. A full tournament-sized Chess set, it features a 3.875'' King with a 1.75'' diameter base. The Chess pieces are extremely heavy, with a weight of 48 ounces, and features felt base pads on the undersides of the Chessmen. 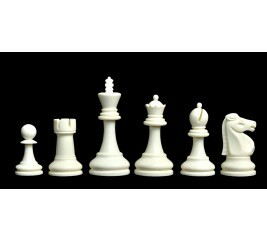 We are proud to offer one of the world's finest Plastic Chessmen - The Executive "Big Knight" Plastic Chessmen. The distinctive feature of this heavily weighted set is the large Knight design which is beautifully crafted. 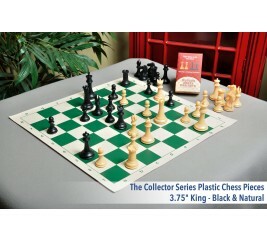 This plastic Chess set features a 3.875" King with a 1.65" diameter base and weighs a considerable 42 ounces. 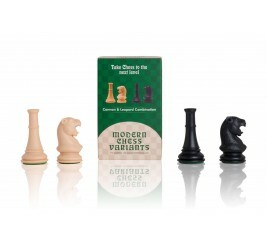 The design and feel of these Chessmen make them ideal for both Tournament and Rapid Play (Blitz) Chess. 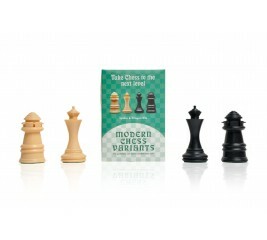 You definitely won't find a more attractive Chess set at this price! 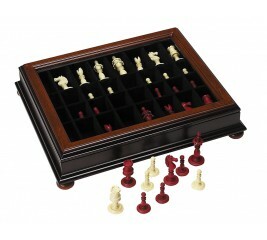 These Chessmen are new and each set consists of 34 Chessmen, 17 light and 17 dark (including the two additional Queens.) 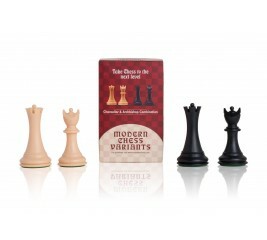 THESE CHESSMEN ARE HIGHLY RECOMMENDED FOR ALL US CHESS FEDERATION TOURNAMENT PLAY. 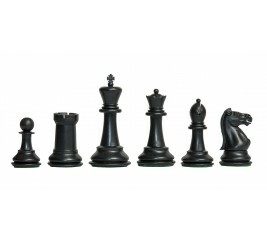 The House of Staunton is proud to offer the Reykjavik II Series Plastic Chess set. 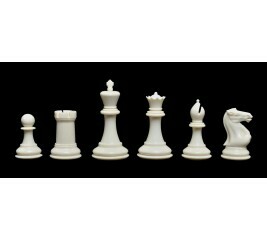 A full tournament-sized Chess set, it features a 3.75'' King with a 1.75'' diameter base and is very heavily weighted. 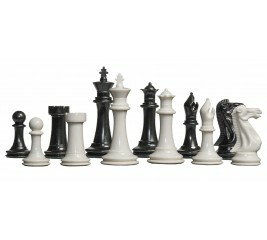 We are proud to offer the Fischer Series Chess set. A full tournament-sized Chess set, it features a 3.75'' King with a 1.75'' diameter base. The Chess pieces are extremely heavy, with a weight of 45 ounces, and features felt base pads on the undersides of the Chessmen. Our new Regulation Silicone Tournament Chess Pieces are an exciting alternative to the same old plastic chess pieces everyone uses. What makes them so unique is that their made out of highly flexible silicone material, which means that they won't break if accidentally dropped. This elastic material has the look and feel of a pencil eraser, which kids of all ages will love! The Musketeer Chess Variant Kit, which features Spider and Dragon Pieces, is an exciting, new way to play Chess! 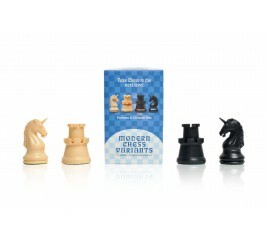 Use these pieces with your favorite set of chess pieces and play Musketeer Chess! 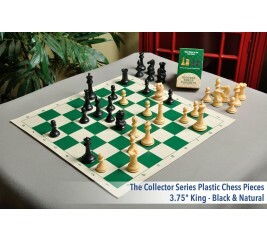 Each kit comes with a total of 4 plastic chess pieces - Black Dragon, Black Spider, Natural Dragon, and Natural Spider. 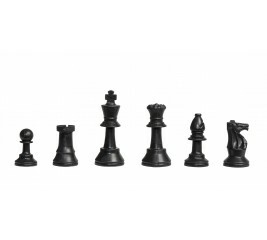 This half-set contains 17 pieces (16 + 1 additional Queen) Our new Regulation Silicone Tournament Chess Pieces are an exciting alternative to the same old plastic chess pieces everyone uses. What makes them so unique is that their made out of highly flexible silicone material, which means that they won't break if accidentally dropped. This elastic material has the look and feel of a pencil eraser, which kids of all ages will love! If you're looking for an affordable, yet high quality set of plastic Chessmen, look no further than our Triple Weighted Regulation Plastic Chessmen. 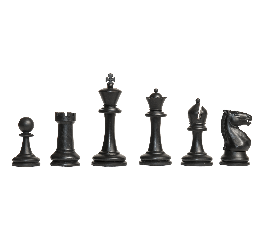 These Chessmen are ideal for schools, chess clubs, and tournament play as they EXCEED all US Chess Federation Tournament Requirements. These are TRIPLE WEIGHTED Chessmen, which means that they are extremely heavy and offer unmatched stability during a game of Chessmen. If you're looking for an affordable, yet high quality set of plastic Chessmen, look no further than our Solid Regulation Plastic Chessmen. These Chessmen are ideal for schools, chess clubs, and tournament play as they EXCEED all US Chess Federation Tournament Requirements. These are the exact same pattern of chess pieces that the US Chess Federation uses at all of it's National Chess Tournaments. 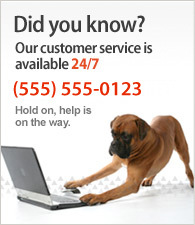 They are made out of SOLID PLASTIC, for additional durability and weighting. 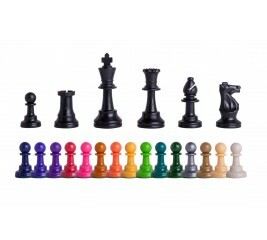 With our Triple Weighted Regulation Colored Chessmen, you now have the ability to go beyond the typical Black vs. White chess pieces by mixing and matching to create your favorite color combination. Black vs. Gold? Red vs. Blue? Pink vs. Purple? The only limitation to the color combinations available is your imagination! If you're looking for an affordable, yet high quality set of plastic Chessmen, look no further than our Single Weighted Regulation Plastic Chessmen. These Chessmen are ideal for schools, chess clubs, and tournament play as they EXCEED all US Chess Federation Tournament Requirements. These are the exact same chess pieces that the US Chess Federation uses at all of it's National Chess Tournaments. If you're looking for an affordable, yet very attractive set of plastic Chessmen, look no further than our Competition Series Plastic Chessmen. These Chessmen are ideal for schools, chess clubs, and tournament play as they EXCEED all US Chess Federation Tournament Requirements. 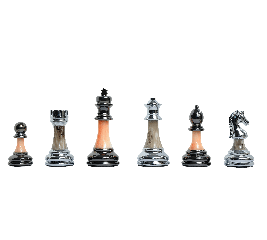 In addition, each set of Chessmen comes with 34 pieces instead of the traditional 32 - We included 2 Additional Queens to be used in the event of Pawn promotion. 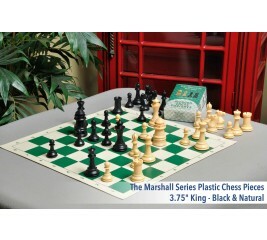 These Staunton-style plastic chess pieces are great for game analysis. The king is 2.5" tall. 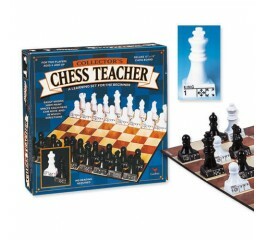 These pieces, along with our 14" analysis-sized vinyl roll-up chess board (sold separately), make a very convenient combo set which will fit on smaller desks at school for those rainy days when the kids can't go outside for recess, or in any space-restricted area, or even to follow along while watching instructional videos or DVDs. Coaches utilize these sets in the skittles room at tournaments specifically for game analysis so students don't have to keep opening their larger tournament gear sets in between each game. 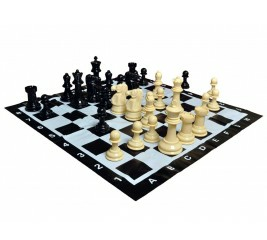 These sets also make great gifts for school chess clubs or at tournaments! 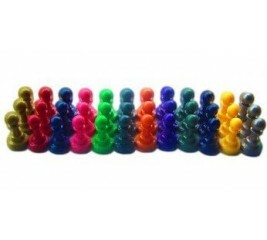 Bring some color to your game with our Regulation Colored Plastic Chessmen. 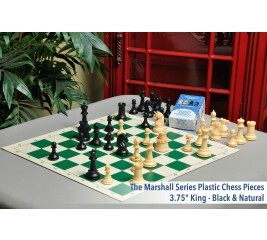 They feature the same Staunton pattern design as our popular Regulation Series Chessmen, allowing you to mix and match colors with your existing black and White set or with more than one Colored Regulation Series Plastic Chessmen selection.